These past few days I’ve been in Madrid, speaking at the Aristocrata club meeting and seeing a few of the tailors and shoemakers I know (Langa, Reillo, Calvo de Mora, Norman Vilalta). I invited Elia Caliendo and Luca Avitabile of Satriano Cinque to speak to the club (on my right and far right in the pic above) and it was lovely to see them enjoy talking about their craft to an audience for the first time. Many of those Spanish tailors were in the audience, and both sides found it interesting discussing the roots of tailoring in Naples and Spain. The influence of Spanish tailors on southern Italian tailoring is often overlooked – they travelled extensively, both to Italy and France. Wearing blue linen jacket from Anderson & Sheppard, with navy grenadine tie and grey-linen hank with white edging (from Trunk). I’m a big fan of the grey handkerchief at the moment – it’s not quite as smart and stark as plain white, and I like the softer impact. Below, selecting cottons at Jose-Maria Reillo. You can follow the discussion on Postcards from Madrid by entering your email address in the box below. You will then receive an email every time a new comment is added. These will also contain a link to a page where you can stop the alerts, and remove all of your related data from the site. It’s always great to have such events… and always great to have you here, Simon! It looks as if your audience is without tie, but all speakers tied. Have you had anything made by Spanish tailors Simon? We obviously all know the well known “centres of excellence” in London, Italy and Paris (which was new to me until I read your blog). 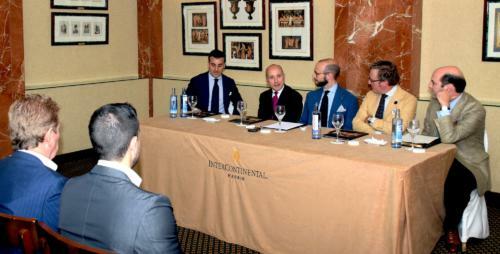 Is there a difference to Spanish tailoring style in the same way there is between British v Italian? I read your other pieces on Madrid, but could not form an overall view if it’s that you are simply recognizing more high-quality European cities for tailoring or is that there is something distinctive to it. I actually started the process of having a few things made on this most recent trip, so watch this space. Overall I would say Spanish tailors don’t have a characteristic style. They are used to being very flexible and versatile, and are therefore places you impose your own style. Everything from different shoulder pad sizes to regular/shirt shoulders and lining options. The work is good, with a lot of handwork but not up to the standard of the best (some Savile Row and all French). And importantly, they are very good value. Between €1800 and €2500 for a suit. I think Elia actually started by saying ‘no tailor is the best, no opinion is correct; this is merely my point of view’. Which surprised everyone, given what they normally get from Italians. Very nice jacket and colour. What bunch is it, if you remember? It’s the W Bill linen bunch. I don’t know the bunch name off hand, but I think there’s only one. Yes, lovely colour blue suit you are wearing . I have been told off for only wearing BLUE and GREY, almost to the point wearing I think my new Naples tailor was a little frustrated by the fact I was only looking at blue swatches… (2 different garments). You must write a piece on how to break free of the shackles of always wearing the same colours. Anything else just feels too risky! Looking forward to seeing the Madrid garments. Do you know who the tailor to the King of Spain is? I’ve seen photos of him in very nice suits. 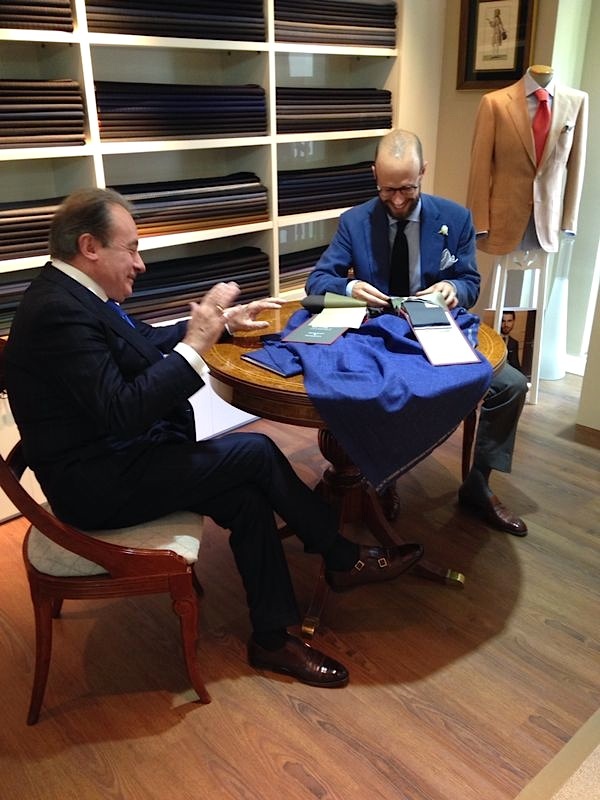 The King’s tailor is Gonzalo Larrainzar and the Prince’s is Jaime Gallo. Would you be so kind to explain in what sence Spanish tailoring is not as good as the best English and French ones? I reserve any comments about the quality of the fit until I’ve had some things made by Spanish tailors – which are in the works at the moment. So Spanish tailors charge less when compared with the best French and Italian tailors and their finishing is not as good. I guess the price reflects the quality of the work. Having worked in Japan and Hong Kong a few years back, I have noticed that the finishing by top Japanese tailors were much better than the top Hong Kong tailors. And top Japanese tailors charge twice that of top Hong Kong tailors. As you have worked in Hong Kong before, have you noticed this as well? The price doesn’t really reflect the quality of the work – it’s more a reflection of the market, the economy and the tradition. Their finishing is as good as plenty of English and Neapolitan tailors I know, all of whom charge more (though some Neapolitans are also cheap). I never had anything made by Japanese tailor personally. But upon return to London the suits I commissioned from Anderson and Sheppard seemed much better than those I had from WW Chan or A Man. So in this sense, I presumed A&S charged more because they put more work (handwork/attention to detail) when compared with WWChan or A Man. Therefore, in a way justifying the price difference. Any opinion on this?